When developing an aircraft, estimating the drag (amount of aerodynamic resistance) the aircraft will experience during transonic cruising is extremely important in determining fuel efficiency. Thus, transonic wind tunnel tests need to produce highly accurate results within ± 1 count in drag measurement (1 count = roughly 0.3% of the total resistance, which is equivalent to 1–2 seats). The leading industrial wind tunnels abroad have almost completely eliminated the technological issues that generate significant error, achieving a relative accuracy (data reproducibility) of ± 1–2 counts. 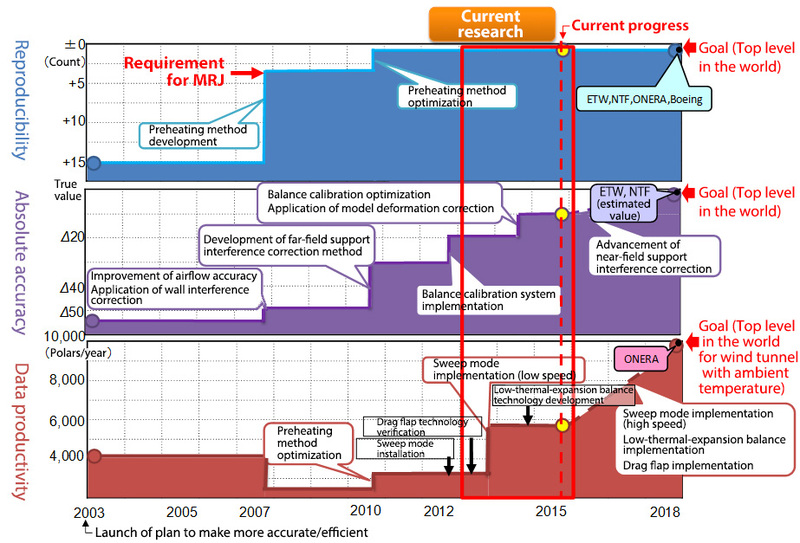 While JAXA's 2m x 2m transonic wind tunnel is approaching similar levels of relative accuracy, JAXA still needs to boost its data productivity to levels comparable with those of the world's leading wind tunnels and improve its absolute accuracy (differences from true values) in order to help develop Japanese commercial aircraft with the world's best cruising performance. Aiming to carve out a place for its 2m x 2m transonic wind tunnel among the world's leading large-scale, industrial wind tunnels, JAXA will work to establish integration technologies that improve accuracy without hurting productivity and boost productivity without negatively affecting accuracy. The keys to increasing accuracy and efficiency in a 2m x 2m transonic wind tunnel are automating, operating, and maintaining the drag flap, which can enable highly accurate control of the uniform stream Mach number when the operator changes the model attitude (the first such initiative in a domestic wind tunnel), in the process of making the high-accuracy sweep mode practically viable. Given that the challenges involved in fully automating the drag flap might be too demanding, JAXA is also working on improving manual operability and performing high-efficiency, high-accuracy tests via a partially manual setup.